Axis Of Oversteer: Bavarian Concerto M88, second movement, andante moderato. Bavarian Concerto M88, second movement, andante moderato. A very nice in car High Definition camera setup in this BMW M1 Procar. I recommend turning up the volume and hitting the "full screen" button on the lower right. 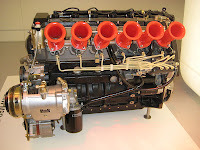 The M88 still produces one of the best engine notes ever, even when not pushed to the max. It just never gets old. lots of twitching going on there, looks a handful going into vale, i hate that corner! I had the pleasure of watching and listening to 3 different M1 procars at the ADAC Classic (Nurburgring 24hour support race) this year, they are absolutely glorious on full chat. I miss my e28 m5 now even more. It sounded almost like that. It looks as though that is two different drivers together. One has a tinted visor and one has a clear one. Also, one can drive and the other cannot. Great video!